Each island was divided into several moku or districts, of which there are six in the island of Hawaiʻi, and the same number in Oʻahu. There is a district called Kona on the lee side and one called Koʻolau on the windward side of almost every island. (Alexander) The moku of Hawaiʻi Island are: Kona, Kohala, Hāmākua, Hilo, Puna and Kaʻū. 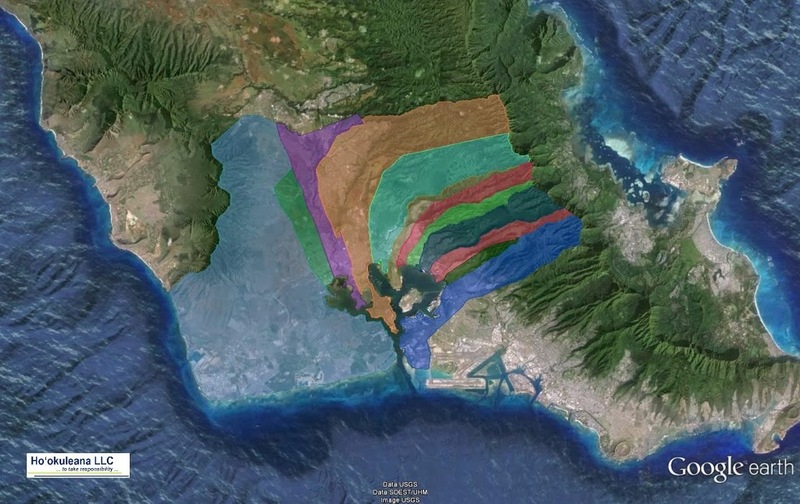 Initial settlement of the Hawaiian Islands is believed to have occurred along the wetter windward sides of the Islands, along the fertile coastline. On Hawaiʻi Island, that included Hāmākua. In more modern times, sugar defined the landscape. Production started with initial smaller plantations that later merged into larger facilities. The Hāmākua Mill Company was first established in 1877 by Theo Davies and his partner Charles Notley, Sr. In 1878, the first sugarcane was planted at the plantation and Hilo Iron Works was hired to build a mill. The mill was located at Paʻauilo. By 1910, it had 4,800-acres planted in sugarcane and employed more than 600 people. The company ran three locomotives on nine miles of light gauge rail. 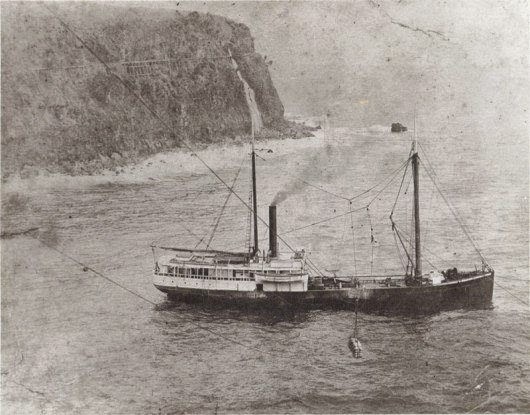 There was a warehouse and landing below the cliff at Koholālole where ships were loaded by crane. In 1917, the Hāmākua Mill Company was renamed the Hāmākua Sugar Company. The Kaiwiki Sugar Company was merged with the Theo H Davies Company-owned Laupāhoehoe Sugar Company on May 1, 1956 and operations were merged with the latter beginning January 3. 1957. In 1978, the Hāmākua Sugar Company, Honokaʻa Sugar Company and the Laupāhoehoe Sugar Company were merged to form the Davies Hāmākua Sugar Company. In 1984 the Davies Hāmākua Sugar Company was bought by Francis Morgan and renamed the Hāmākua Sugar Company (1984-1994). The Hāmākua Sugar Company operated until October of 1994, and its closing marked the end of the sugar industry at Hāmākua, as well as the Island of Hawaiʻi. 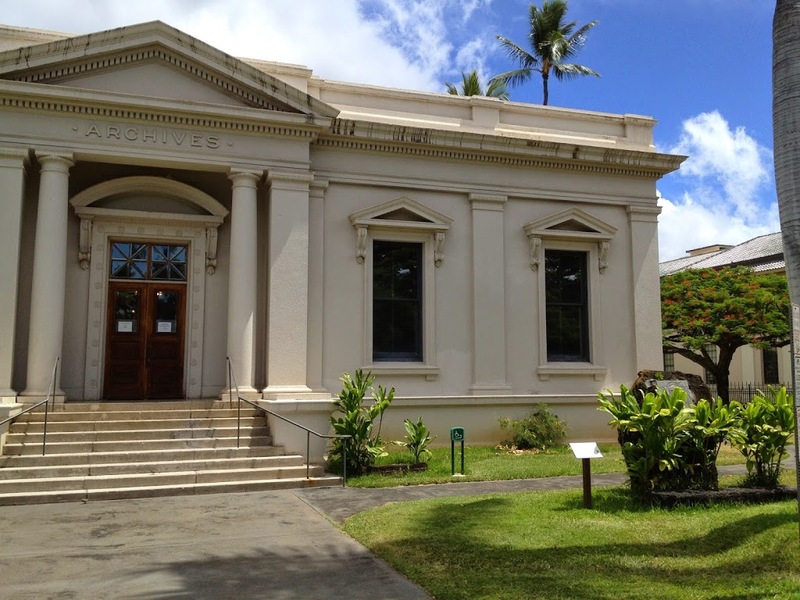 Hāmākua Sugar Plantation Days Festival is being celebrated 10 am – 5 pm, Saturday, August 16, 21014 in Honokaʻa, commemorates the closure of the Hāmākua Sugar Co 20 years ago. The image shows cable loading of sugar. In addition, I have added some other images in a folder of like name in the Photos section on my Facebook and Google+ pages. Waipi‘o (“curved water”) is one of several coastal valleys on the north part of the Hāmākua side of the Island of Hawaiʻi. A black sand beach three-quarters of a mile long fronts the valley, the longest on the Big Island. In the 1780s, warring factions were fighting for control. The island of Hawaiʻi was in internal struggle when one of the aliʻi nui, Kalaniʻōpuʻu, died. He passed his title to his son Kīwalaʻo and named his nephew, Kamehameha, keeper of the family war god, Kūkaʻilimoku. Kīwalaʻo was later killed in battle, setting off a power struggle between Keōua, Keawemauhili and Kamehameha. The 1782 Battle of Mokuʻōhai gave Kamehameha control of the West and North sides of the island of Hawaiʻi. This was the first naval battle in Hawaiian history – Kepuwahaulaula, – known as the Battle of the Red-Mouthed Guns (so named for the cannons and other western weapons;) from here, Kamehameha continued his conquest of the Islands. Fornander recounts that the great high chief ʻUmi “built large taro patches in Waipiʻo, and he tilled the soil in all places where he resided.” So it is readily apparent that the valley was intensively cultivated from long ago. The valley floor was once the largest wetland kalo (taro) cultivation site on the Big Island and one of the largest in the Islands; but only a small portion of the land is still in production today. Waipiʻo was a fertile and productive valley that could provide for many. Reportedly, as many as 10,000-people lived in Waipiʻo Valley during the times before the arrival of Captain Cook in 1778. Kalo cultivation and poi production in traditional Hawaiian was the mainstay of the Hawaiian diet. In the later part of the 19th-century and early half of the 20th-century its commercial manufacture became an important economic activity for the residents of Waipi‘o Valley. There is limited access (due to the steep and narrow roadway) into the valley. Warning signs at the top of the extremely steep and narrow Waipiʻo Valley access road restrict use to 4-WD vehicles in low range to keep a reduced speed and to save your vehicle’s brakes. 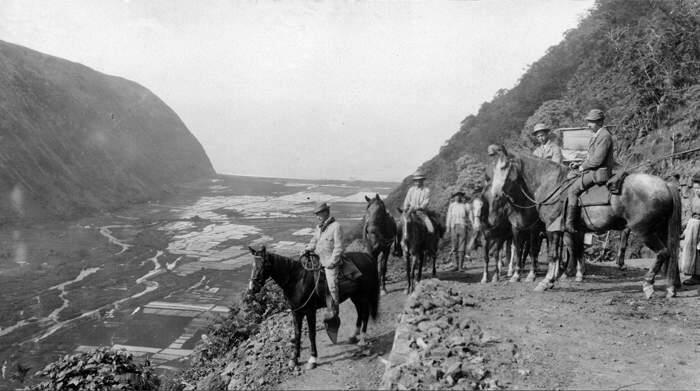 The image shows horseback riders heading down into Waipiʻo Valley in 1909 (the present access into the valley is near the ocean.) In addition, I have added other images in a folder of like name in the Photos section on my Facebook and Google+ pages.